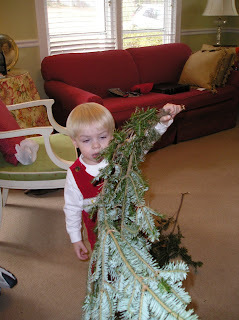 Our tree picking ritual was all out of whack this year. My volunteer obligations for the Holiday Market cut into my usual time line. 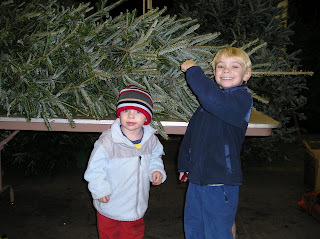 Anyway...we took the little sweet potatoes to pick out our Christmas tree. 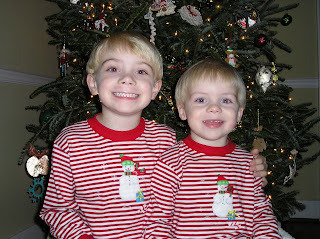 They have so much fun and are so proud of their tree EVERY YEAR! Fulton was hilarious and really got into it this year! 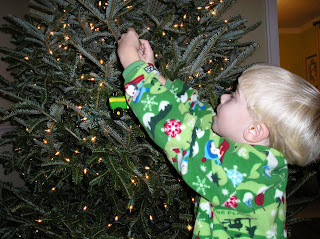 The had a great time putting the ornaments on. There were only two ornament casualties...one of which was my fault! We're takin' her home folks! 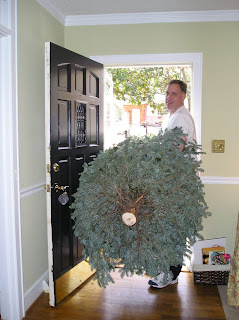 My annual ultra-cheesy picture of Shannon bringing in the tree! Shannon trimmed a branch off an Fulton picked it up and said "No Daddy! Don't break it!" It was so cute! 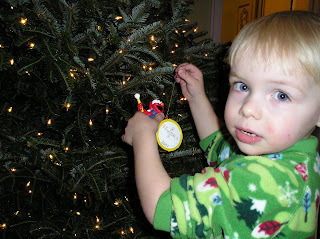 Then Fu got his turn...he chose his Elmo ornament from NaNa. Mommy finished up (re-decorated) the tree the next day and they posed in front of the finished product for their Christmas card picture. 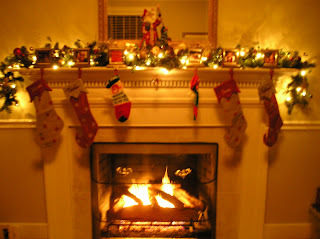 This is my favorite of my simple Holiday decor! I made a GIGANTIC 24 loop bow with the guidance of none other than the professional bow-maker, Cathy Tronco via phone! And I love my glittery balls! I used a red, apple green, and gold theme this year with lots of lights. 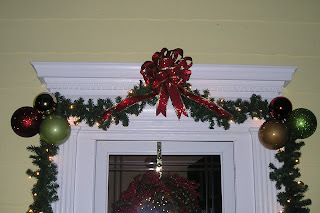 I also use the same balls, smaller versions, on the mantel with this really neat garland that I took apart and stuck into the garland. I'll try to get a close up of it and post it later. Okay, I'm by NO means a photographer but I thought this was a pretty Christmasy shot...Not bad in my opinion!